the Vedic personification of Neptune. Neptune was discovered in the 1800s. Most of our present understanding of this gaseous giant comes from the 1989 flyby of NASA's Voyager – II, this confirmed that Neptune is composed of mostly hydrogen and helium. Neptune makes one revolution around the Sun every 163 years and 253 days, which translates to a velocity of about three one-half miles per second. A vast, slow and a mystical planet, Neptune is the outermost major planet in the solar system. Neptune is the trident bearing, Greek God of the sea and the ruler of the zodiac sign of Pisces. Neptune requires one eighth of a generation to move through a single sign and represents the obscure, indeterminate forces of nature that are beyond the comprehension of the average person. Being the planet of spirit, he is always revolutionary, the giver of life. An individual with a strong influence of Neptune has acute sensibilities, but is a simple and straight-forward person, who says just exactly what they mean. Neptunians possess a distinct ability to anticipate the thoughts of others before they are expressed. However, this may lead to an impatience, which results in confusion and misunderstandings. By virtue of their ability to visualise the complete picture, Neptunians can foresee the outcome of events before others, but are rarely surprised by this. It is important that they overcome their tendency to be vague in the details of their plans, as they may at times be accused of being imaginary or impractical. Relying on the assistance of someone less creative and more objective will be of benefit to them. Neptune diseases are often of an unusual nature. Sometimes these are of a slow, wasting nature, while at other times they may be just the opposite. In an excited state, this planet can produce psycho-hysteria. Neptunians are mature as young people and youthful after mid-life and they possess a love of experience. Those born under the strong influence of this planet are usually so remote from the average individual that they may feel themselves somewhat solitary figures, among their contemporaries. In general, they have a hunger for love, sympathy and happiness, but not in the same way as the ordinary person craves. They don't take life too seriously. Those with a powerful influence of Neptune in their horoscope can have a heightened psychic awareness and due to the effects of the vibrations of this planet, they also possess the gift of second sight and clairvoyance. One can easily spot a person born under a strong influence of Neptune, they stand out in a crowd. At first glance they convey an unmistakeable, yet indefinable impression that they are not as others are. They possess eyes with a peculiar magnetic quality and appear in some way, peculiar and highly individualistic, but not in any specific way. Neptunians can often be coldly penetrating, or shifty and secretive, with a slight hint of eccentricity. Those born with Neptune as a dominant planet, have very singular and subtle moral and mental characteristics. They often betray a contradictory nature, a perversion, a whimsicality, or some element of mockery or masquerade. In younger people Neptune can exert the influence to instil a yearning of the spirit that can lead to the use of alcohol and drugs. More often than not, Neptunians are found to possess abnormal vices. Neptune is not used in traditional Vedic or Chinese astrology. Neptune represents the obscure, indefinable force of nature, strength and life. It influences the zodiac sign of Pisces. It causes nervousness and heart problems. 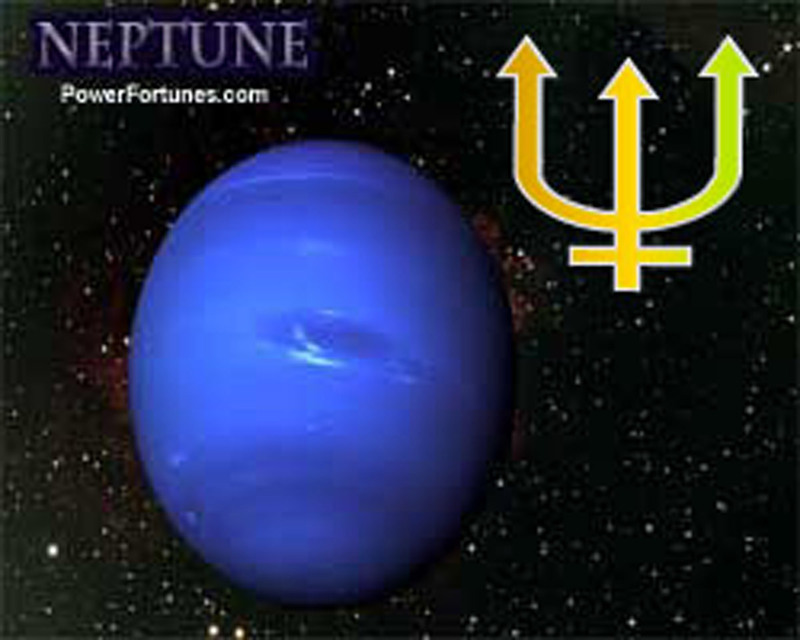 According to numerology, Neptune's number is '7'. The direction associated with Neptune is, West.